Citing the position accuracy of new GNSS constellations, Australia’s Intergovernmental Committee on Surveying and Mapping (ICSM) is moving to modernize the country’s current datum system. 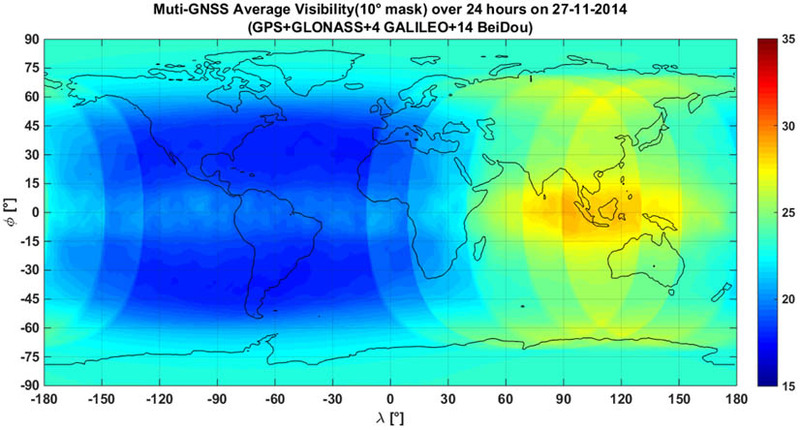 Australia’s current system, the Geocentric Datum of Australia 1994 (GDA94), was implemented before the advent — and precision — of such GNSS constellations as a Selective Availability–GPS, and GLONASS, Galileo, and BeiDou. In addition, GDA94 was implemented in 2000 as a response to the World Geodetic System 1984 (WGS84) reference frame used by GPS receivers — at a time when unit accuracy was only 10 meters. Because of its location — within the "footprint" of BeiDou GEO and inclined geosynchronous orbit (IGSO) satellites, the Indian Regional Navigation Satellite Syste, and Japan’s Quasi-Zenith Satellite System (QZSS) — Australia has a richer access to GNSS signals that most other nations around the world. “The advent of multiple GNSS constellations and continual improvement in technology will deliver the potential for all Australians to measure locations with accuracies of a few [decimeters], and eventually a few [centimeters]. Modernizing the national geodetic datum will ensure it is directly compatible with these GNSS measurements, which will differ by approximately 1.8 meters to GDA94 coordinates by 2020,” said ICSM on its website. GDA94 is a static, or plate-fixed datum, where coordinates don’t change. Since 1994, Australia’s tectonic plates have moved 1.6 meters, which is significant when industries deploy equipment relying on accurate positioning data such as mobile phones and in-vehicle navigation, ICSM said. The agency also said that accurate navigation through GNSS-enabled maps will continue to be critical to such emerging technologies as automated vehicles, new transport, and emergency services. The country will transition to the new datum, dubbed GDA2020, in two frames, ICSM said. The first frame, which will establish a plane-fixed datum beginning on January 1, 2017, allows tools and supporting resources to be available to users until no longer needed. The second frame, starting on January 1, 2020, allows changes in the country’s surface point coordinates due to plate movement — and will coexist with the plane-fixed datum, ICSM said. The organization also said that the first step to GDA2020 demonstrates that change is possible using current technology and spatial data management techniques. “GDA2020 coordinates will be immediately compatible, at the decimeter level, with GNSS-derived coordinates referenced to global coordinate systems used by GNSS such as WGS84 or ITRF2014 (International Terrestrial Reference Frame 2014), and will remain so for several years,” ICSM said. ICSM said the reference date, or epoch, for the new GDA is set at 2020 to ensure that the datum has the best alignment to GNSS reference frames after 2017. ICSM recommended that a GDA Modernization Implementation Working Group (GMIWG) prepare a GDA2020 questionnaire for both government and industry users. The survey, completed in May with 1,067 respondents, asked users if they were aware of the plans to modernize GDA94. One of the questions asked users if they were aware that all GNSS systems operate in an Earth-fixed reference frame that shows the change in feature coordinates over time. Only 25 percent of the respondents were unaware of the difference between the Earth-fixed reference frame versus a static, plate-fixed datum.